It’s really going to be fun! These faces are not to be taken too seriously, they are just for fun! Age limit for the camps is 9-15 years old. The projects will be fairly simple, however, your child should know how to thread a sewing machine. The campers will need to bring a sewing machine (or you can rent one of ours for $5 a day). Please pick up a supply list when you register for camp. This year’s kid’s camp is full of projects that will appeal to both girls and boys. There are many projects including a backpack, a custom dog leash and collar and a pillowcase. All of these items will feature the Fortnite Llama. Come by the shop to see samples. Space will be limited to 5 students per session so please reserve you space as soon as possible. Join us for a fun sew long as we stitch Kimberbell’s “Make Yourself at Home” quilt. The kits are available at the store with a class discount when you enroll. Regardless of where you are in your quilting journey you can experience better quality piecing when you utilize Deb Tucker’s Studio 180 Design Tools and techniques. As a result of taking the Tucker University you can gain new techniques without the obligation of having to complete a full quilt top. A different tool is taught monthly on the second Tuesday of the month. Continuation of the first year of Tucker University. Are you ready to explore the world of quilting with a smaller project? Piece and quilt this table runner in three classes. You will learn rotary cutting techniques, chain piecing and much more that you will use repeatedly as you make future quilts!! Pattern included in class fee. 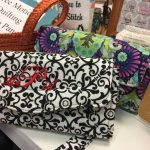 If you’ve mastered the basics of binding your quilts but want to learn 3 ways to make your bindings fancier, join us for this class. You can check out my quilts on my blog: ZippyQuilts.blog. If you are ready to perfect your free motion deigns and move beyond the basic stipple and meander, join us to learn various free motion quilting designs, techniques and tips. 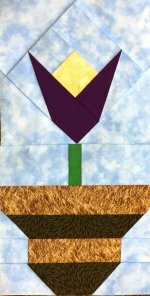 Learn basic paper piecing as you make a paper pieced crocus that can be used as a table runner or wall hanging. Pattern included in class fee. A tee shirt quilt is as good as a memory book!! Take your favorite tee shirts from school or sports activities, concerts or vacation travels and have a great quilt plus a conversation piece on the back of your couch!! Fast, easy and fun quilts from precuts. 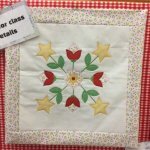 This class will meet every other month to make some great quick quilts. We will be making beautiful quilts from Layer Cakes, Jelly Rolls and Charm packs. Dive into the Gypsy Wife Quilt by Jen Kingwell. Learn foundation paper piecing, strip piecing and fussy cutting as you create this wonderful sampler section by section. Foundation papers and organizational chart included in class fee. This is for everyone who has been asking for an evening class. Get into your stash and scraps and do some spring cleaning! All you will need to purchase for this quilt is the border fabric and the light fabric for the snowball blocks. You will use two of the Tucker Tools to make sure that your blocks fit together perfectly. Storm at Sea is a beautiful traditional pattern that is notoriously difficult to piece. Come see how you can make it easier by using the Diamond Rects and Square Squared rulers. The pattern assumes you will use those rulers, but I will suggest alternatives if you do not want to use them. Class will focus on construction of the basic units so you can make the quilt shown on the pattern, my variation, or your own variation. Please note that you will find this class easier if you have already learned these rulers or consider yourself an intermediate quilter. If you have less experience you are certainly welcome, but expect a challenge! You can check out my quilts on my blog: ZippyQuilts.blog. There are many, many ways to improvise both blocks and quilts—come learn a few of them and decide how you want to improvise a quilt of your own! You are welcome to copy one of my ideas or to bring something else you want to use for inspiration. You can check out my quilts on my blog: ZippyQuilts.blog. Whether you're new to Bernina Embroidery Software or looking to build on your skills, this class is for you. Come see new techniques and products, watch the webinar and learn more about what software can do for you. You'll be amazed! Class fee includes DVD webinar to take home. Want to make a really cute colorful and fun rug? This is a fun and easy sewing project that makes an oval rug approximately 30” x 44”. Try your hand at sewing cork with a simple envelope style wallet. As you make this project you will see how easy the Bernina non-stick sole presser feet make sewing on cork & similar fabrics. This will be the last wallet you will ever need! Fun to make and very practical with space for all your essentials. This pattern makes a great purse or a large tote to carry all of your sewing and quilting supplies. Use a jelly roll or cut 2 ½ inch strips from your favorite fabric. Make this cute bag using our new cork fabric. It is called cork “fabric” but is really authentic cork mounted to fabric. The cork is very easy to work with and this adorable bag is easy to make in a day. Cork is a great medium for embroidery. Make a cute fee standing cork monogram to decorate a shelf or hang on a door. REMEMBER, we ask that you please take Machine Mastery # 1 first. The other classes can then be taken in any order. Machine Mastery # 1: Introduction to Your Machine is required before all other classes. Needles, Threads, Maintenance, Basic Stitching. Machine Mastery # 3: Basic Operation continued Buttonholes, Button Sew-On. Machine Mastery # 5: Zippers, Continued Free Motion, Bernina Stitch Regulator, Double Needle, and Wing Needle. 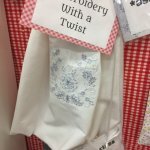 Machine Mastery # 7 Embroidery Basics class Learn all about embroidery threads and needles, stabilizers and hooping and what you can do with your new embroidery machine. You will only bring your large oval hoop to this class. Machine Mastery # 8 is all about using your new embroidery machine. You will need your entire machine, embroidery module and large oval hoop for this class. Sit & Sew will be every Monday from 10:00-3:30. Leave the housework at home, bring out those projects that need finishing and come on over for some "sewing camaraderie". There will always be someone to help you if you get to one of those spots that you just can't figure out. I know I can accomplish more if I am sewing away from home without the ringing phone and the laundry that always needs to be done. Did you know Studio Stitch rents machines? If you don't have a sewing machine, don't want to haul your machine to class, are thinking about purchasing a new machine, want to embroider something, or are just learning to sew, stop by and talk to us about our "in store" machine rental program. 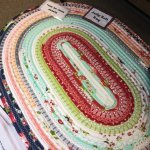 Looking for a quilt guild in the area? Our weather policy for classes is to follow the Guilford County School System’s schedule for closings and delays. If Guilford County Schools are closed, our classes for that day are canceled, but the store may or may not be open according to the actual road conditions as the day progresses – please call before you come in if schools are closed. If there is a 2 hour delay for schools we will be on our regular schedule and classes will be held. Please join us for some of our great upcoming classes. We have some great teachers and projects lined up to teach and inspire you! Be sure to sign up soon as our classes fill up quickly. All classes at Studio Stitch require registration prior to the day of class. Please call, e-mail, or register in person with a staff member. All class fees should be paid in full upon registration. Any class supply lists and/or special instructions should be supplied upon registration. Please make sure you pick them up when you register. Classroom machines are available upon request, a $5.00/day fee will be added to the cost of Class. Student should be prepared to provide their own thread. Please contact us if you are unsure what type of thread is required for your class. Studio Stitch reserves the right to cancel any class (including mastery classes) if the minimum enrollment is not met. Our rule of thumb is to make the final call (based on enrollment) one week prior to the start date of class. We will do our best to let each of our students know if a class has been canceled, but ultimately it is the customer’s responsibility to check with Studio Stitch to confirm the class has made. If a class is canceled by Studio Stitch and/or teacher due to low enrollment student will get full refund or store credit of class fee. If a class is canceled due to unforeseen circumstances including illness, weather, etc we will do our best to reschedule at a later date. If a student should need to cancel or drop out of a class they will get full refund if they let Studio Stitch know at least one week prior to class start date. There is no refund if student cancels within the week before class.